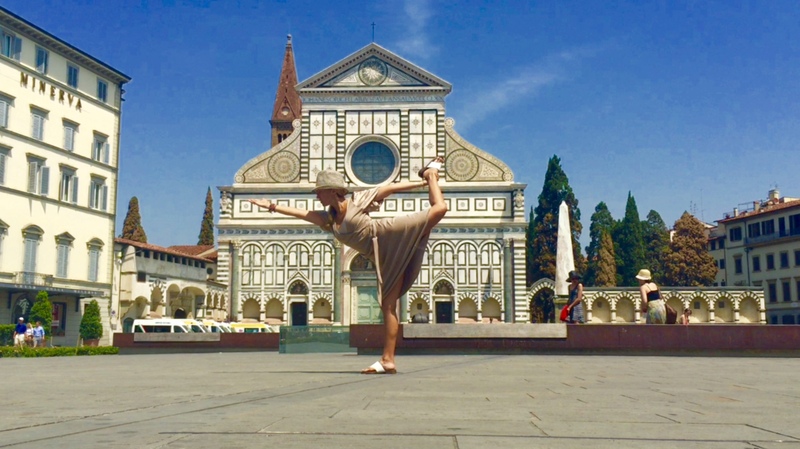 You’ve been asking me for years to offer an Italy Yoga Teacher Training program. YES, YEs, Yes! 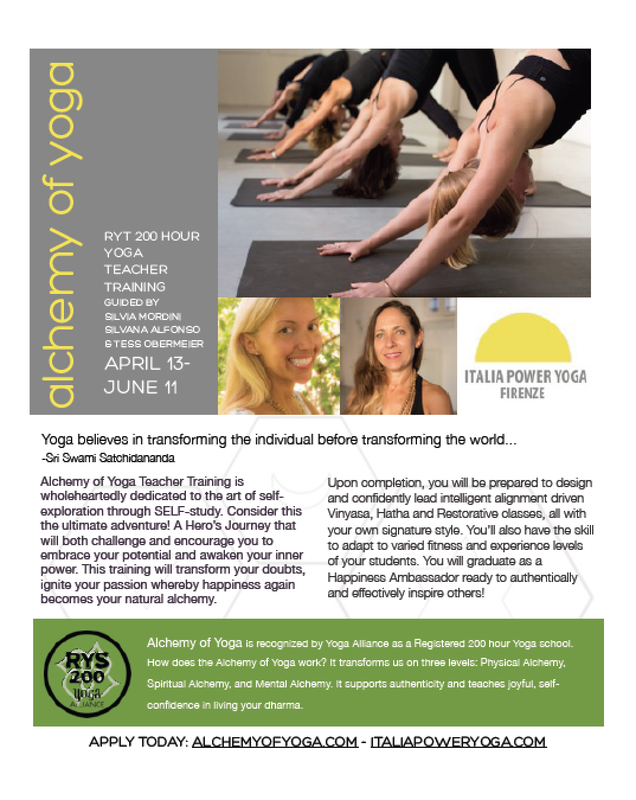 Join me in Florence April 13-June 15, 2016 or even part of the time with our module offering, at Italia Power Yoga founded by my dear friend Silvana Alfonso. *Extended sessions. Detailed calendar provided upon registration or request. To start this journey together, we will explore the self. We will root into a foundation that is grounded in our highest potential. In addition, this module will focus on Sun Salutations, General Principles of Poses, The Stages of Poses, Benefits of Poses, Purpose of Poses, How to Teach a Pose Safely to All Levels of Students, Meditation, Pranayama, and Yoga Therapeutics. This module corresponds to Training Manual EARTH + FIRE sections and Chakras 1-3. This first wave of this module will focus on the fundamental principles of Hatha Yoga (Sun/Moon) including an introduction to Classical Yoga Philosophy (Yoga Sutras: Yamas and Niyamas, 8 Limbed Path), History of Yoga, Basic Sanskrit, the Implications of Ethical Behavior and Living Your Yoga with an Ethical Code and Ecological integrity. This portion of the module corresponds to the Training Manual FIRE+ AIR sections and Chakras 4-5. The second wave of this module will focus on the art of teaching including Creative Sequencing in Class Design, Developing Life Affirming Class Themes, Importance of Positive Languaging, Vocal Intonation, Musical Awareness, and How to Teach to the Heart of the Student. This section also focuses on the Healthy Teacher-Student Relationship: understanding the dynamic and how to resolve ethical issues and the Art of Assisting: providing verbal and physical adjustments and enhancements in an authentic, safe and generous way. This portion of the module corresponds to the Training Manual WATER section and Chakras 6-7. This portion of training will focus on the practical skill development of apprenticeship through taking asana classes, observing classes, assistant teaching, and karma yoga (community service yoga offering). Also explored will be personal development with respect to the Business of Yoga. Planning a yoga career/business – how to best market yourself while maintaining strong ethical standards and life balance/how to resolve ethical issues that arise from teaching yoga – with the possibility to explore additional topics. Transcendent, pure – of unimaginable beauty. Bringing joy to ruler & ruled, to peasants and kings. All evil is transformed into goodness. You are the Master Alchemist! In heart & soul of every being.